Underarm odor is a common issue. Let me explain the cause and some treatment options. Everyone has glands in their underarm area called apocrine glands. These glands secrete oily fluid (a type of sweat) that have no smell when they reach skin and soften it. This softened oily skin is very appetizing for bacteria. The reason you smell is not because you secrete this oily fluid, and not because the oily fluid softens your skin, but because of bacteria on your skin that break it down. Bacteria are all over our skin. These bacteria like the oily secretion released by the glands of the underarm and how it softens the skin proteins. The bacteria degrade the oil and skin protein into ammonia and various types of fatty acids which give off the odor you are complaining about. People with excess smell from their underarms often have more and larger apocrine glands than others, making this more of an issue. Bacteria on our skin are normally not harmful. But in this situation, you want to decrease the number of bacteria in your underarms or decrease the sweat released by the glands of your underarm decrease your body odor. 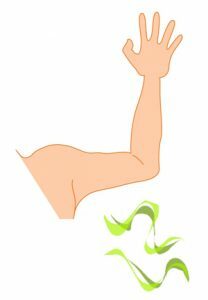 Other uncommon causes of underarm odor are: hormone changes either in puberty or menopause; diseases from organs (liver or kidney disease) causing toxins to be released in the skin; and rarely a zinc vitamin deficiency can contribute to body odor. See our Physicians and P.A.s at Doctors Urgent Care for the highest quality medical evaluation and treatment. We treat excess sweating and underarm odor.